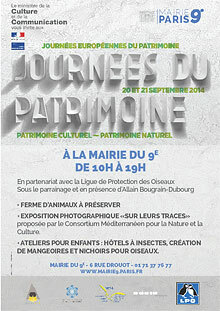 The society for protection of nature in Lebanon (SPNL) will participate in the European Heritage Days which will take palce in Paris, on 20-21 September 2014. The event Titles “Cultural and Natural Heritage Days” will include a preserved animals farm, the Ecancourt farm, with rare goat species and other animals. A photographic exhibition “On the Move” proposed by The Mediterranean Consortium for Nature and Culture, and a workshop for children with “insect hotels” and bird feeders and birdhouses making. SPNL in collaboration with LPO (Ligue pour la Protection des Oiseaux) agreed to pursue their shared objectives through means of a Partnership Agreements establishing the basis for mutual collaboration and development of projects aiming at linking nature and culture conservation. Today, On the Move exhibition is moving to Paris to be part of “Journee du Patrimoine” that will be held in municipality of Paris 9th district in partnership with LPO and organized by SPNL and Diversearth. 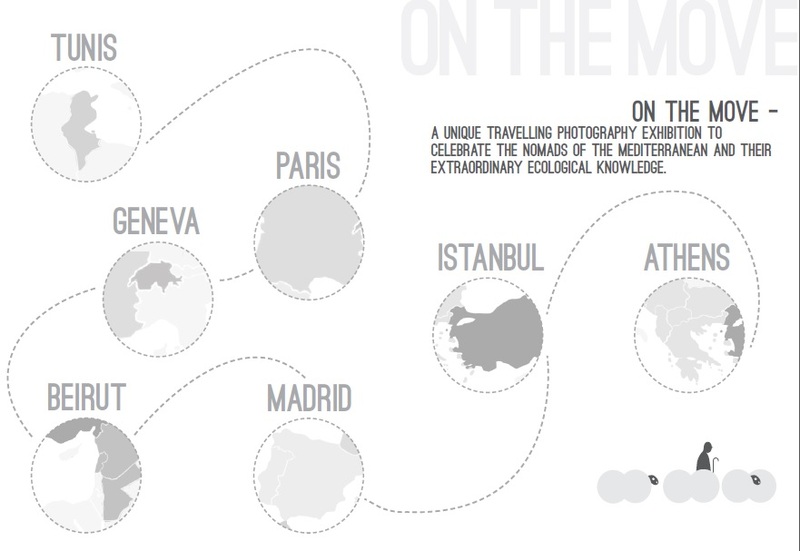 “On the Move” is an exhibition of professional photography (and film) commissioned by the Mediterranean Consortium for Nature and Culture funded by MAVA foundation. It celebrates the lives, challenges and ecological knowledge of transhumant shepherds and nomadic pastoralists in the Mediterranean region. Six professional photographers will be featured in this unique travelling exhibition from Tunisia (Wassim Ghozlani), Morocco (Younes Tazi), Spain (Gema Arrugaeta), Greece (Stamos Abatis), Lebanon (Assad Saleh) and Turkey (Baris Koça) which is presented in a striking collection of 60 photographs. On the Move has been launched and organized in Tunisia by WWF Mediterranean in North Africa and Diverseearth in July 2014. In addition to the photo exhibition, SPNL funded by UN Women Fund for Gender Equality to participate at Paris festival, will be marketing the products of the local communities and empowering women through Souk El Hima. Traditional products that are linked to nature will be taken from Lebanon all the way to Paris for display also supported by EU & CEPF. Traditional pastoralism is facing difficult times in the Middle East today. The Society for the Protection of Nature in Lebanon (SPNL) has been leading the Mediterranean Consortium’s project here and has been exploring the many threats to both pastoralism and nature in the region (Lebanon, Jordan and Syria). Not only is the political context difficult, there is little understanding of the different types of pastoralism and transhumance there, and its real impacts on nature in light of changing climatic conditions. Policies have been unsupportive and even harmful for years and rangeland management takes little account of the knowledge of shepherds in decision-making. European Heritage Days was created in 1984 by the French Ministry of Culture and takes place annually on the third week of September. The 12 million visitors in 2013 confirmed that for almost thirty years this special celebration testifies the love of the French for history and arts. Such success lies in the great diversity of heritage offered: together with the masterpieces of civil or religious architecture, examples of industrial or agricultural activities, parks and gardens, archaeological sites, furnishings, literary or military heritage are also recognized. Every year a national theme sheds light upon an original or innovative aspect of heritage, new openings and outstanding animations (guided visits, skill demonstrations, concerts, theatrical performances, themed itineraries). This enables local initiatives to be associated around the event and enhance structured communication. Heritage continues to exert deep fascination through the countless traces left by communities over the centuries. The purpose of these Days is to lift the veil on our surrounding treasures that are sometimes forgotten and which deserve recognition equal to their wealth and uniqueness. The EHDs thus provide marvelous opportunities for the general public to discover public buildings (Élysée Palace, Senate, ministries, embassies, town halls, as well as theatres, hospitals, schools) and private buildings (villas, castles, factories) which open their doors for the first time, revealing their unique history or secret collections. Every year over 17 000 sites participate. The event also highlights the expansion of the notion of thematic, as well as chronological heritage, which is embodied in territorial heritage policies. Next Saving Migrating Birds? Socialize!